Everyone becomes older. Not everyone becomes an elder. We get older by the passage of time. We do not necessarily become an elder. We get to become an elder by joining the realm of conversation, which entails deep listening and wonder. If you are someone in the first half of life, we must invite people who are older than us into a space of being treated like an elder. This is not about naive reverence, but this type of mentoring relationship requires an earnest perspective that eventually, we will also become older one day. If you are someone in the second half of life, make room to enter into conversation, not preach, and to listen to someone into speech. Question in order to listen, not listen in order to question. To be the best teacher, we need to become great students. The ultimate touchstone of our lives is not self-improvement. Ultimately, any form of self-improvement is for the benefit of others. Otherwise, self-improvement becomes a self-indulgent enterprise, purely for its own sake. The ultimate act is to grow the ability to be a witness (I prefer the word with-ness) to another. 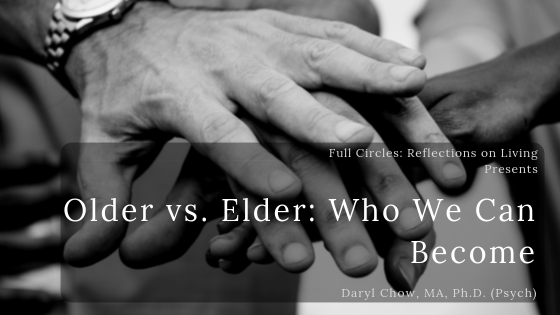 To become an elder, we must be warmly invitational. To help the older person be treated as an elder, we must suspend what we think we know, and appreciate the lived experience of the other through sharing of stories. Holding our ideas lightly—as if to pray not with clasped hands, but with open arms—invites others into a space that helps others see themselves in a truer light, either as an elder, or a to-be elder. I first learned about this distinction from author and mythologist, Michael Meade.